Amusingly for such a new event, the Gathering seems to have many different rumours around how it was set up in the first place. 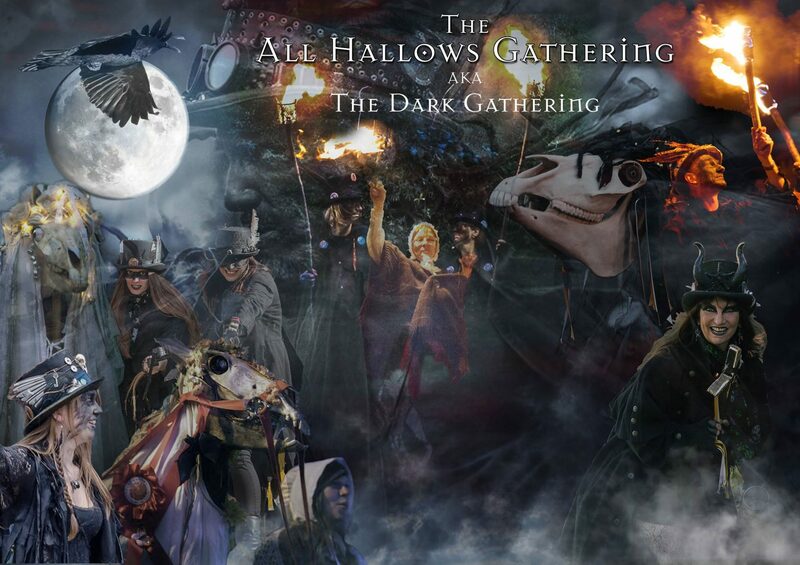 So I thought I’d dedicate a page on this website to the factual and documented history of the All Hallows Gathering. The creation of the Dark Gathering seemed to happen by chance, but turned out to be led by Fate to the extent that I would say that there appear to be gods directly connected with the Gathering in Boscastle. I think that it’s fair to say that all that was required was a seed of an idea and the right sort of environment for it to thrive in. Of course, none of this could have happened without some key people being involved to act as protagonists by networking, organising – helping make it happen by working damned hard. However, there are still some ‘pinch-me moments’ when you witness just how many folk are effected by this community event. The Dark Gathering stirs up powerful energies which directly link with the eldritch time of year, so the event hasn’t been without it’s dramas ‘seen and unseen’! Four years ago in 2014 we set off on a historical journey. We were taking our Obby Oss, Penkevyll to meet the Welsh Mari Lwyds for the very first time. Our Oss had never met any other skull Osses so was delighted to be amongst kin and cousins in culture and language. We made many friends and learned lots about this particular corner of the folk world which is populated by fantastical beasts – and yet also holds within it an anarchic stance which flies in the face of the establishment – hence lots of dis(guising) and blacking up. Chepstow Wassail 2014 was an experience that stayed in my mind for many weeks after the event. Therefore it was great to receive an email in the autumn that same year from a couple we had met previously at the Wassail. They were coming to Cornwall to celebrate their wedding anniversary and would we like to meet up and bring Penkevyll to see their Mari again? This was when Laetitia Latham-Jones had the brilliant idea of meeting up at the Museum of Witchcraft & Magic, Boscastle. I contacted the Museum and they agreed, so we were good to go! I thought it might be fun to make ‘a bit of a do’ about it and used social networking to conjure up some interest to come to the Museum to witness Penkevyll welcoming the Mari Lwyd into Cornwall. We encouraged folks to dress up and bring musical instruments and we were very fortunate is attracting the attention of some significant ‘movers and shakers’ within their various disciplines. There was to be something about it all that captured the imagination of so many others and the whole event gained momentum as a result. That year the first Gathering was modest, but it contained within it the seeds of it’s future potential. On a dark and stormy night in Tintagel a small group of people put their heads together and supported our idea of opening up the Gathering more to include entertainment before the arrival of the Maris – i.e. Dark Morris dancing. It was Angie Latham who dealt with the Morris side of things, whilst I saw to the organisational logistics of the Osses and Maris, and liaised directly with the Museum of Witchcraft & Magic and local establishments. This continued until March 2016 when Angie, due to health issues, retired as Morris co-ordinator and I became the sole organiser. It goes without saying that an event that has reached the proportions it has in such a short time could not operate without the goodwill and the co-operation of others. This is the strength of the Dark Gathering which makes it such a moving and powerful community celebration – long may it last! For more detailed information about the story behind the Dark Gatherings, check out our Archives.